Finding the best dry Riesling in the Finger Lakes is like choosing between great films. If you stick to the best producers, those concerned with quality rather than just moving inventory out the door of their tasting room, you will have a wealth of options. (That is a significant qualification; there are lots of inventory pushers here). Winemakers in this cool climate have mastered the craft of making clean wines with good acidity but only a few have that extra dimension that makes their wines stand out. Of course, what counts as “the best” in wine can change from day to day (or hour to hour) based on the weather, the company, or the background music. But after a month of tasting, when I lined up my accumulated booty of dry Rieslings on the counter and sampled from each bottle, this one stood out. The opulent, expressive nose is intense and complex with apple, lime woven with hints of pineapple, and lovely crushed rock top notes, aromas so precise and generous I literally spent several minutes enveloped in them before taking a sip. Hovering between dry and medium dry, in the mouth it enters full and ripe with short-lived pineapple giving way to a tangy midpalate of lime, grapefruit and minerality, before turning chalky and then leaping to a long coda of pure, lucid, spring water. The lithe body hints at weight but then demurs, settling for a soft, suede-like texture with subtle grain until the prickle from the resonant acidity transgresses. A mercurial shape shifter, hinting at something then moving away, showing ebullience, then austerity, then purity but finally serenity. Winemaker Johannes Reinhardt brought his early experience with Riesling from Germany to the Finger Lakes where he made award-winning wines for Anthony Road Wine Company before striking out on his own. 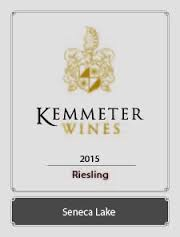 Kemmeter is a young winery with vineyards still developing but already a star. Johnny Flynn’s Fol de Rol with its ebullient voice and quasi-reggae feel, soft bass notes in the background vocal, and lyrics extolling the serenity of a spiritual quest brings together all the dimensions of this wine.